Florida Foreclosure Assistance is a new website designed for buyers and sellers considering Florida foreclosures or short sales. The site contains informative articles, videos, news feeds and links to educate buyers and sellers. The short sale process is outlined as well as the pros and cons of selling short. Dickenson reveals Foreclosure Defense Secrets, a publication written by a prominent Florida foreclosure attorney. Find out what the banks don’t want you to know in a comprehensive 39 page guide that is absolutely free to download. Florida Foreclosure Assistance contains a list of the 20 most frequently asked Q&A from buyers and sellers about short sales and foreclosures. This is a must read before you enter into a contract to buy or sell short. The new website also contains articles on new Florida and federal laws pertaining to short sales and foreclosures. A new Florida law allows homeowner associations (HOA) to collect the lesser of 1% of the mortgage amount or up to 12 months of unpaid HOA dues from lenders after they foreclose. Unfortunately, the new law does not apply if the property is sold in a short sale and this can actually encourage lenders to foreclose if too much is owed to the HOA. 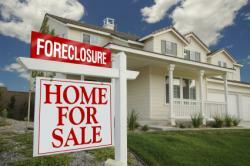 A new federal law requires mediation before lenders can foreclose. "I recently attended a foreclosure hearing with a client and less than 10% of the owners actually showed up. The judge was sympathetic to those who took the time to attend and granted a 120 day extension to give owners more time to complete a short sale. The other 90% who failed to attend the hearing were foreclosed," said Dickenson. HOA’s have recently discovered that they can foreclosure much quicker than lenders because the owner does not have a legal defense in this situation. The HOA obtains a certificate of title from the court which allows the HOA to rent the property or negotiate a deed-in-lieu of foreclosure with the lender. A local foreclosure attorney reviews the pros and cons of HOA foreclosures in a featured article on the new website. If you’re a tenant renting a property in foreclosure, a new law could allow you to stay in the property up to 90 days after the lender forecloses. “Tenants need to understand all the new laws before entering into a lease agreement on a property that is in the foreclosure pipeline,” said Dickenson. Florida Foreclosure Assistance also contains nearly a dozen links to government recommended websites to repair credit, obtain credit counseling, new government policies and a description of short sale scams. “Unfortunately there are people out there trying to take advantage of owners in distress and this government site does a good job of keeping track of the cons,” said Dickenson. Kevin Dickenson is in the top 2% of 64,000 Prudential agents nationally and can be contacted through his website http://www.kevindickenson.com.